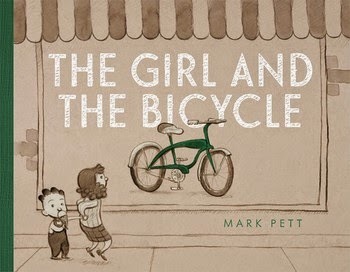 From the Book Jacket: A touching wordless picture book about a little girl, a shiny bicycle, and the meaning of persistence - with an unexpected payoff. A little girl sees a shiny new bicycle in the shop window. She hurries home to see if she has enough money in her piggy bank, but when she comes up short, she knocks on the doors of her neighbors, hoping to do their yardwork. They all turn her away except for a kindly old woman. The woman and the girl work through the seasons, side by side. They form a tender friendship. When the weather warms, the girl finally has enough money for the bicycle. She runs back to the store, but the bicycle is gone! What happens next shows the reward of hard work and the true meaning of generosity. Why It's On My Bookshelf: I just added this really POWERFUL wordless picture book to my shelf. I think it's extraordinary. When I got to the last page I teared up. Not the sad kind of tears, but the ones from the good place in my heart. When the girl goes back to the store to get the bicycle and it is gone, she does something most might not fathom. She goes into the store with her hard earned money and buys her little brother a tricycle. She leaves empty handed. But it's not about acquiring things, she acquired so much more - the invisible stuff. Character. When she gets home.....that's when the magic of kindness really hits......see below. Get the kleenex. Kids will really love this message. These acts of kindness are the things they yearn to do. Such an encouraging heartwarming story. I feel lucky to have discovered it. a touching wordless picture book about a little girl, a shiny bicycle, and the meaning of persistence—with an unexpected payoff.